The Fiji Performing Rights Association Music Award winner, Nasio Domoni is one the most popular bands around. Band leader, TuvereTuamoto spoke to GARAM MASALA (GM) on how they began, challenges they face and the long term plan for the band. GM: Just a brief summary about the band? TT: The band was formed in 2005 from regular sigidrigi sessions around the kava bowl on the weekends. We started singing covers of popular Fijian songs from Drodrolagi Kei Nautosolo, JaleMareau, Jim Gucake, Senibuasala to Voqa Ni Delai Dokidoki and even some English numbers. The boys started performing in events such as birthday parties and family gatherings. The band had changed members over the years and in 2013 we recorded our first album (titled- Isa Cagi Tokalau) with renowned Solomon Island recording engineer and artist Young Davie. The first album was slowly getting airtime in Fiji as the sounds were quite new to Fijian listeners however it was getting the airtime it needed in the Solomon Islands, Vanuatu and PNG. We recorded our second album (titled- Ko Voroka Na Yaloqu) in 2014 and was an instant hit with our local radio stations. We recorded our third album in 2016 which followed on from our previous album and won two awards in the 2016 and 2017 FPRA awards. GM: The meaning behind the name, Nasio Domoni? TT: Nasio is the name of the clan (mataqali) the members of the band are from in Namuka, Macuata in Vanua Levu. We’re mostly family members and formed from family gatherings. GM: Type of music the band plays? TT: We play reggae, vude and country music. GM: Do you do original songs as well? TT: Most of the songs we play are original but time to time during gigs and concerts we usually do covers. GM: What do you think sets you apart from other bands in the country? 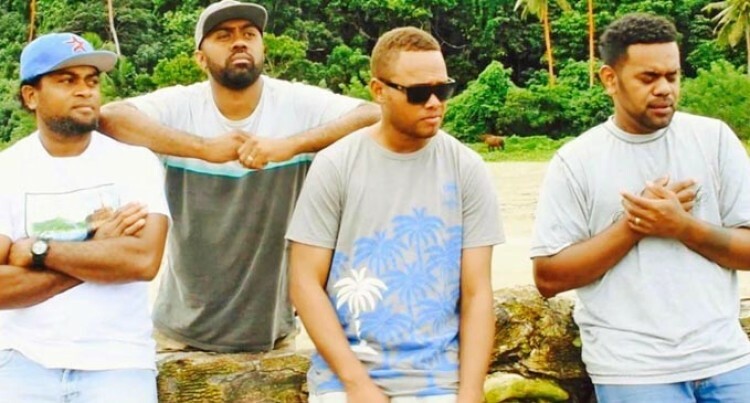 TT: We were the first Fijian band to venture into music videos in promoting our music through YouTube and Social Media sites like Facebook and Twitter. Our songs are composed by the group members themselves and have collaborated with Pacific island music engineers to change the style of Fijian music. GM: Where do you guys normally perform in or events you’ve been a part of? TT: We used to perform at the Kick Off Nightclub on Saturdays but have pulled out to focus more on producing and recording songs as sometimes having regular gigs will turn your focus away from producing songs. GM: Do you guys do music a full-time career? TT: The band members all have regular jobs and music is just a part time job during the weekends. GM: What is the long term plan for the band? TT:We are focused on setting up a recording studio that will assist all budding talents in the country who have the talents but are constrained financially in recording a song or an album. GM: In regards to social media has it worked towards your favour? TT:Social media has been our strength in promoting our music not only in Fiji but to the Pacific and also to Fijians living abroad. Now when we release new songs, we release it on the airwaves and also on the social media platform. GM: Challenges that the band encounters? TT: Finance continues to be our challenge and this is something that not only affects but other bands in Fiji. Piracy and remixing of our songs is something that is haunting us at the moment. GM: Have you performed with other local artists? TT: We have performed with various bands such as The Gang and collaborated with Bill Cokanauto of KKU and Young Davie. GM: How did it feel winning at this year’s Fiji Performing Rights Association Music Awards? TT: It was awesome winning the best iTaukei song for two consecutive years Na Veikilai Lekaleka Mosimosi” in 2016 and this year the song “Senikakala”. We also won the premier award of best composition in 2017. All the hard work and sacrifice in completing our album has paid off. GM: Who is the bands greatest inspiration and support? TT: Our greatest support comes from our family, friends, and the fan base. The 4-member band- TuvereaTuamoto- Nasovivi, Namuka, Macuata, Jofiliti Sucuvou- Nasovivi, Namuka, Macuata, Seru Tawake- Naua, Namuka, Macuata and Sailosi Waqawaqa- Nabavatu, Dreketi, Macuata. You can check them out on their official NasioDomoni Facebook page for more information.